For most of us, at least one teacher stands out in our memory as someone who encouraged and inspired us to do our very best. 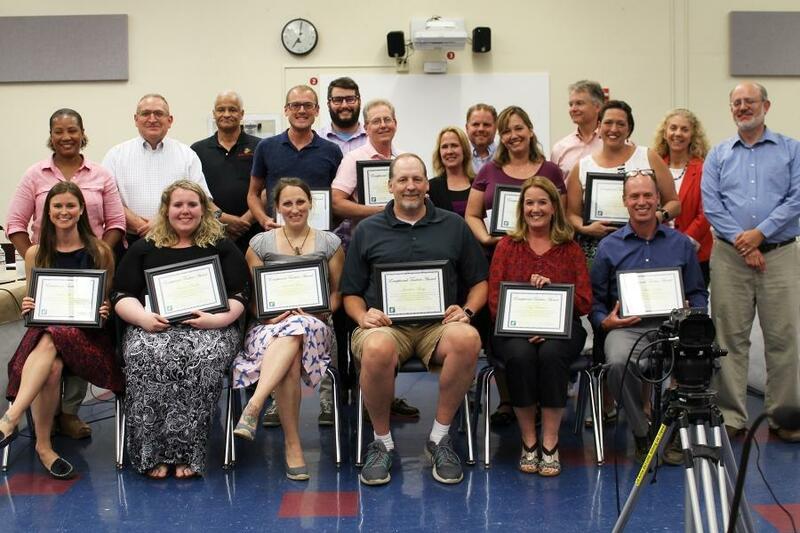 This week, the Keene Board of Education presented the 8th Annual Exceptional Teacher Awards to ten teachers within the Keene School District. These awards are a way for our community to recognize our teachers for their exceptional work on behalf of our students. The ten teachers were carefully chosen from over 100 nominations submitted by colleagues, parents, and students. Each teacher awarded will receive $500. The Exceptional Teacher Award is not intended to be a lifetime achievement award, but rather recognition of current outstanding accomplishments. Mastery of sound classroom instructional skills, which not only encourages the intellectual interests, but also stimulates the creative work in all students. Use of initiative, creativity, and innovation in teaching techniques to inspire students toward independent and original thinking. Interaction with students in ways which demonstrate professionalism, while retaining respect, humor, compassion, and concern for the whole child. Supports student achievement within the Keene School District curriculum while addressing the educational, social and emotional needs of all students. Participates and engages in quality professional development. Utilizes motivational and leadership skills with students and colleagues. Positively interacts with staff and parents. Demonstrates enthusiasm and vitality in learning and teaching. 2011 - John Bass, Andrea Dube, Melanie Everard, Erika Greenwald, John Kersey, Pam Merrow, John Ohlson, Kate Skinner, Jeremy VanDerKern, and Barbara Ware. 2012 - Megan DiRusso, Linda Fisk, Marianne Lavatori, Tina McLaughlin, Linda Risley, Lisa Seelen, Kristy Symonds, Amy Strong, Jen White, and Deanna Zilske. 2013 - Danielle Heeran, Martha Kennison, Peg Hartz, Johanna Kress, Pauline Brackett, Karen Gianferrari, Lisa Larocque, Jennifer Antoseiwicz, Andrea Levin, and Ali Carr. 2014 - Kate Abbott, Kimberly Baker, Christopher Barry, Monica Foley, Susan Grover, Susan Romano, Debbie Sawyer, Thomas Sullivan, Tracy Thompson, and Jack Timmons. 2015 - Forest Bencivenga, Karen Cloutier, Beth Corwin, Brenda Haenchen, Kristina Hartwell, Barbara Kaufmann, Morris Kimura, Amanda Paul, Eric Stinebring, and Christina Villeneuve. 2016 - Nicole Crank, Donna Fairbanks, Carol Ferlini, William Hope, Paul Kohler, Dawn Loughery-Symonds, Kathy Peters, Benjamin Peirce, Kate Shanks, Nikole Starkey. 2017- Greg Croteau, Guy Harrington, Jessica Hall, Tina Lepple, Ginny McManus, Sarah Osuwu, Beth Sibley, Kimberly Simpson, Jessica Smith, Teresa Starkey.